بسم الله الرحمن الرحيم Sufi News and Sufism World Report: "This Episode Should End"
Ajmer: Cracks appeared in the unity among the khadims at the mausoleum of Khwaja Garib Nawaj Chishti on Thursday over the issue of removal of dargah nazim Ahmed Raza after a CD containing his alleged controversial statements on Islam and the Sufi saint came to light. A month ago, the khadims lodged an FIR in the Dargah police station alleging Raza of religious deviation and making objectionable statements. A mob of khadims attacked the nazim, whose hand was fractured. 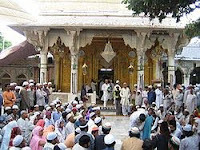 According to the khadims, the nazim is appointed by the Centre to look after the management of the dargah only. "He is not a saint who delivers speeches on religion and Sufism," Syeed Julikar Chishti said and alleged that Raza talked wrong things about the Khwaja. Irked over the issue, the khadims went on a month-long agitation and made every effort to remove Raza from the post. They even met Union minister Salman Khursheed and Prime Minister Manmohan Singh. However, claiming that nothing objectionable was found in the CD even after a long agitation, khadim Jahoor Chishti demanded resignation of the members of the Anjuman Committee (committee of khadims) who registered the case against Raza and started the agitation. "They did everything they could have done. But the government found nothing objectionable in the CD. Now the khadims should end this episode," Jahoor said, adding, "They have tarnished the image of the khadims by creating such scenes." On the other hand, the Anjuman Committee is still trying to remove Raza. "Even the Committee of Moulvis took the matter seriously and found that the nazim should not say such things about religion," said a khadim. Meanwhile, the police have arrested six people for attacking Raza and are searching for three more in the matter. The question is: What was the statement of the Nazim that the matter came to such a pass. The general public must know this, especially the ahl-e-dargah. Was it a question of Aqida? Was it a calumny against the Great Khawaja Sahib? All these need to be looked into.